HockeyPucks hiking and highpointing: The Pinnacle - Hooksett NH - 485 Ft.
From Rt. 3A (River Road) in Hooksett turn on to Pinnacle St. Parking is 0.1 miles on the right. Look for a large gravel lot with parking for 10-12 cars. There are no signs marking the parking lot. I was told parking can be found at the cul-de-sac at the end of Ardon St. When I passed by the cul-de-sac was filled with Private Property / No Trespassing signs. According to the signs the 5-10 Foot area between the sign and road is private and shall not be crossed. The unmarked trail begins to the right side of the unnamed gravel parking area on Pinnacle road. The wide, clear and well outlined trail dips then begins a very gradual .11 mile incline to a T intersection with a summit sign pointing left. This is a steeper "short cut" At .16 miles you will reach a short and steep pitch and a trail intersection with the blue trail at .17 miles. I continued on the less traveled and thinner "shortcut" along the cusp of a steep ridgeline. The grade becomes more moderate then meets the "blue" trail intersection a third time 0.25 miles. From the intersection the trail inclines flanking a series of cliffs around the western perimeter of the Pinnacle. At 0.33 miles the trail ascends the lowest of cliff area 100 Ft. to the summit. 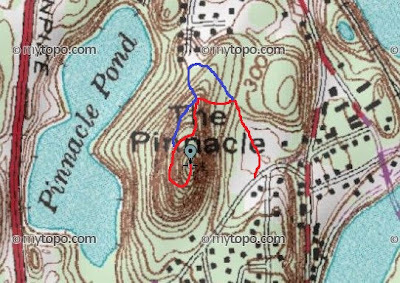 A trail (marked in blue) parallels the ridge trail and descends towards Pinnacle Pond it meets at the first (0.17 mile) intersection. The summit is mostly open offering clear views of Mt. Kearsarge to the north and the town of Hooksett and Merrimack River to the northeast. The summit was not signed however I found 2 rods drilled into the granite rocks. Each were about 1/2" diameter and protruded 2-3 inches from the rock surface. The Pinnacle is the very prominent peak that can easily be seen from route 93 directly after the Hooksett Toll Plaza. The two pictures above are the small rods embedded into the granite at the summit. The rods are the only remains of a fire tower which once stood at the top of the Pinnacle. I received a reader comment from Karl who provided a very useful link with details on the tower on a Hooksett History webpage. Thanks Karl for the info. Views to the north and northeast from The Pinnacle summit. This was a short but very rewarding hike over semi-rugged terrain that offered great views into the Hooksett area. Thanks for providing the link to the Hooksett history page with details on the fire tower. interesting feature. I enjoyed reading the admission price of $0.10 per person. I've edited the description adding the link under the images of the embedded rods.